Corrected errors with letters A, W, X & Z. Added kerning code to problematic letters. TY for this really wild font! I love this font and I'm using it to create and theme a tabloid cover for a final digital imaging design class. I'll send it to you if you would like to see it when I finish this week. Thanks for the inspiration. can i use this font for the t-shirt of our class?? En modifiant un peu la police elle est parfaite pour illustrer des documents sur l'immobilier. How long did it take you to so this!? This is incredible! 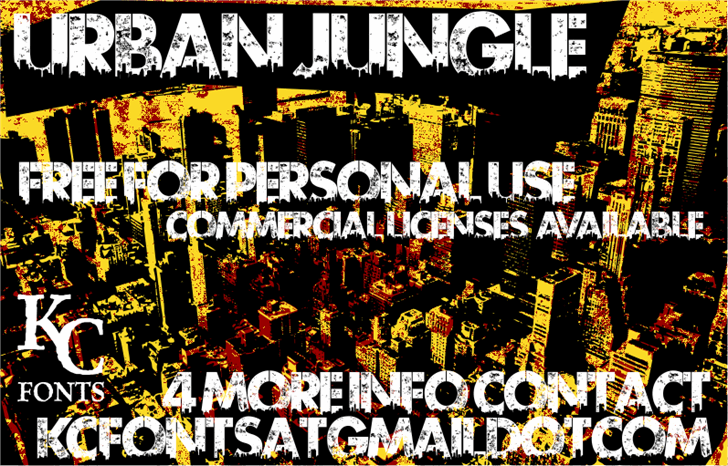 Urban Jungle DEMO is a trademark of Kevin Christopher.